I feel like there was this collective groaning all over social media this morning. Too much Thanksgiving indulgence = now it's time to detox, exercise more, "eat clean," etc. I'm not immune to this way of thinking, but at the same time -- at the ripe age of 30, I've grown tired of the whole back/forth of eating as it relates to the holidays. Haven't you? Doesn't it get tiring? Honestly, I struggle year-round to keep my eating in check. I haven't kept this a secret from you guys, so this is a topic that I'm raising as we deck the halls, but it's not season-specific. Slowly I've learned a few tricks to make healthy eating more automatic. Over the next several days, I'll be sharing my top 5 (or so) tricks to help you make it through this festive season (or just life) without feeling like you need to continually hit the reset button. And if this stuff works for me, there's a wonderful chance it might help you, too! If you cook with mostly fresh food like we do, you might not step into the freezer section at your local grocery store. I only recently started venturing to those parts because Ada is partial to frozen peas and waffles. And when I did the whole month of freezer dinners, I became much more open to different ways of approaching meal time. The more I nosed around the chilly aisles, the more interesting stuff I found. For example, not only can you purchase frozen peas, broccoli, corn, peppers, spinach, squash, and pretty much any other vegetable + fruit you can imagine -- but many stores also have these great veggie mixes. I knew that sort of stuff was on the shelves, but our Wegmans has these really interesting Asian varieties that are absolutely perfect for stir-fries in a pinch. True, many of these veggie packs aren't organic and some come with these highly processed sauce mixes that are questionable. But at the low price point (yup -- pretty inexpensive!) and convenience factor -- I'd rather toss these in my wok than resign myself to munching on whatever enticing chocolate pie leftovers are in the fridge. Preparation of these frozen veggies is simple + fast, too. 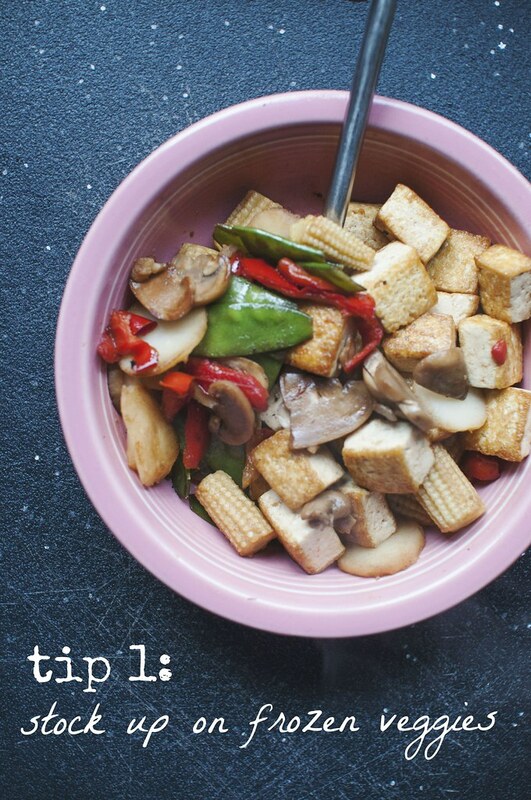 I usually fry up some cubed tofu or an egg or two, then I set the protein aside and add a little olive or sesame oil to the hot pan. On medium-high heat, I then take a cup or two of veggies (that's just a single serving) and cook until warmed through, but still crisp (that's the trick, because mushy isn't good at all!). I then splash on a bit of low sodium soy sauce, a squeeze of juice from freshly grated ginger, sprinkle on some sesame seeds, or use whatever else I have around the kitchen to spice things up. I often make rice or some other side dish, but it's not necessary if I'm in a hurry. A healthy meal can be made in like 10 minutes. Seriously! 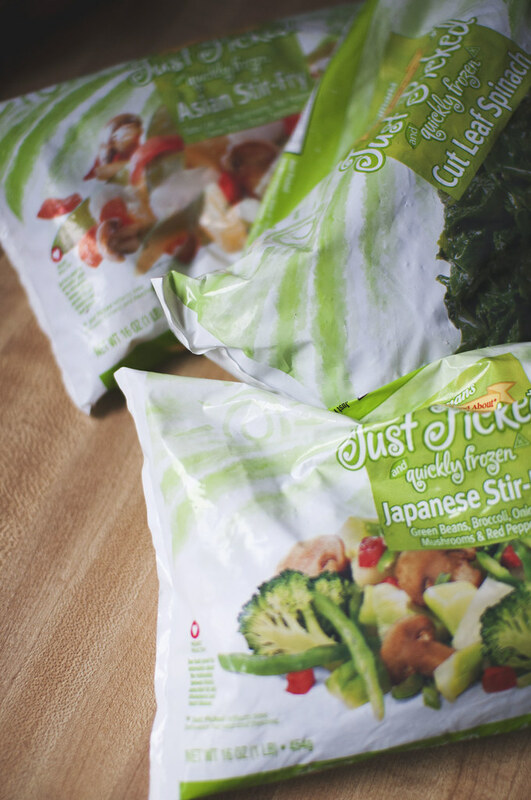 For us, frozen vegetables are a solid backup plan if we find ourselves scratching our heads around dinner time. Or if I can't figure out what to eat (or pack for Stephen) for lunch. Or if we're running low on CSA produce or just trying to save a little money. If you'd like to hold out for organic, local freezer veggie options, there are winter CSA shares in many parts of the country. Just ask around at your local farmers market. We've taken part in the past, and it's super helpful. All those flash frozen packets of goodness make wonderful soups, pot pies, stir-fries, and stews. Heck. With enough foresight, you could even make your own mixes! I'd love to think ahead in the bountiful produce season to have these quality frozen ingredients on hand, especially for this time of year. Sigh. Foresight isn't one of my best qualities. Do you cook with frozen vegetables? How often? How do you use them to your advantage?